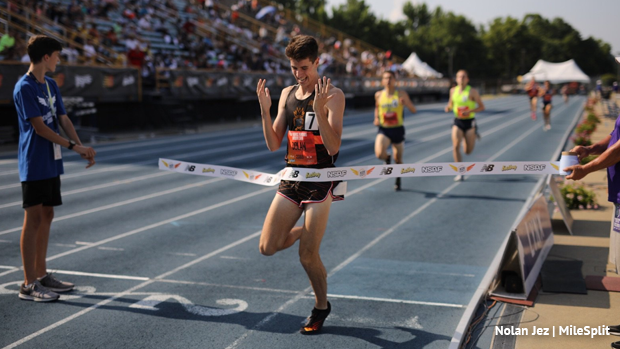 Sean Dolan of Hopewell Valley, the New Balance National champion in the mile last June, threw down a US #1 and NJ #3 all-time perfomance in the 1,000-meter run at the New York Road Runners Night at the Races on Thursday at the 168th Street Armory in New York. The Villanova-bound Dolan, running unattached in an open race, finished fourth in 2:25.39 in the 1,000, to take over the national high school lead in the event this season. Dolan ran 56.30 for the final 400 and 27.66 for the last 200. Dolan's 2:25.39 puts him in some very fast company as he moved in the No. 12 spot on the All-Time U.S. list, and No. 3 all-time on N.J's all-time list. The only two NJ runners to go faster than Dolan over 1K are Olympian Robby Andrews, who ran the national record of 2:22.28 as a senior at Manalapan in 2009, and Ben Malone, who ran a US #2 all-time 2:23.56 as a junior at Pascack Valley in 2012. Earlier this week, Dolan, received an invitation to run in the high school mile at the Millrose Games on Feb. 9, which is the same day that Hopewell Valley is competing at the Central Jersey, Group 3 meet at the Bennett Center in Toms River. Hopewell Valley coach Aaron Oldfield said on Friday that the plan is for Dolan to run at Millrose, just like he did last year. Last spring, Dolan put the finishing touches on a remarkable outdoor campaign with a sizzling double at the New Balance National Outdoor Championships at the University of North Carolina A&T in Greensboro, North Carolina. After a big 1:49.82 anchor leg on Saturday night to bring his team across sixth for All-American status in the championship 4x800m with a time of 7:41.84, the junior came back the next day to win the mile in 4:12.22. Dolan was in fourth place at the half-mile and second with a quarter to go, but he cranked out a 2:03.4 final 800m and a 59.8 second last quarter to rally for the victory. Dolan's personal best in the mile came when he ran 4:08.86 last May to finish second at the adidas Boost Boston Games, and the Penn Relays in April he blasted a monster 4:07.57 to anchor to bring Hopewell Valley from way back to capture the DMR Championship of American title in a meet record 9:57.77.